We only have one planet earth, so as a civilization we must take care of it. It's no secret that the number of people on this planet is growing exponentially. Since the dawn of the industrial age, this rapid growth combined with our extreme dependence on fossil fuels, has put us on an accelerated path of destruction. From climate change and pollution to the economical benefit of saving tons of money on your electric bills, having a solar power system installed at your residence or business makes so much sense. Studies have shown that even if you have to finance a system, you will still get a great financial return over the lifetime of your photovoltaic system. Everyone can benefit from solar power. View our solar panel webcam! The sun is the most abundant and underutilized source of energy we have. On this site, we present all the information you would ever want to know about residential and commercial photovoltaic systems to not only benefit you, but also our planet and way of life. 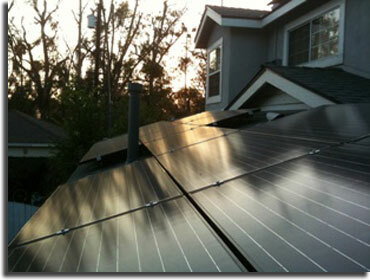 The first and most obvious benefit of a photovoltaic system is the environment. Even if you don't agree with the convincing scientific theories of climate change, it is not debatable that the burning of fossil fuels pollutes the air we breath. With the air quality continuing to decline, it will only get worse for our offspring and future generations. There is also a great financial benefit to owning a photovoltaic system. In addition to raising the value of your property around the same amount you paid for your system, the average return from investing in a photovoltaic system is typically between 10% - 15% per year. That is equivalent to the average return, on a good year, of the S&P 500 stock index, without the downside risk! These not widely known, yet simple facts, make a photovoltaic system a remarkable financial investment. You can also bring energy independence to yourself and your country by removing our dependence on foreign oil one roof at a time. There are three main types of photovoltaic technologies available to the consumer today. 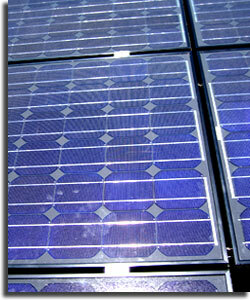 Monocrystalline Silicon, Polycrystalline Silicon, and Thin Film. Each of these different photovoltaic technologies has its own advantages and disadvantages, generally related to size, efficiency, and aesthetics. An additional benefit to solar power systems is that there is not much difference from installation to installation, which helps to bring down associated labor costs. Your standard grid-tied photovoltaic system uses the same basic solar components, namely, an inverter, solar modules (solar panels), and some miscellaneous wiring and switches. Off-grid photovoltaic systems use two additional components, specifically, a battery array, and a charge controller. Peripheral components such as system performance monitoring equipment can be added if desired. There are many additional ways to reduce your energy consumption at your home or business. These include swapping out your old light bulbs for new super efficient LED lights, replacing your power hungry appliances such as your refrigerator, washing machine, and air conditioning units with new energy star models, and properly insulating and sealing your house. Another benefit to utilizing these energy reduction techniques is to allow a smaller photovoltaic system to be purchased since you now require less power for your same daily routine! Many communities are coming together to help make a difference for our planet and their pocket books. Community efforts, from California's "Million Solar Roofs" initiative to the phenomenal rebates offered by some local utilities such as Anaheim Public Utilities's "Solar Advantage" program are helping to pave the way. Combined with the 30% federal tax credit, you can have up to 75% of your system paid for with rebates and tax credits! Have solar panels installed today!